RA Pielke Sr. Position Statements | Climate Science: Roger Pielke Sr.
For the next two weeks, I am on travel and will not be posting. In this post, I want to summarize some of my viewpoints on climate science. i) There has been global warming over the last several decades. The ocean is the component of the climate system that is best suited for quantifying climate system heat change. The warming has been less than predicted by the multi-decadal global model predictions; e.g. Levitus, S., et al. 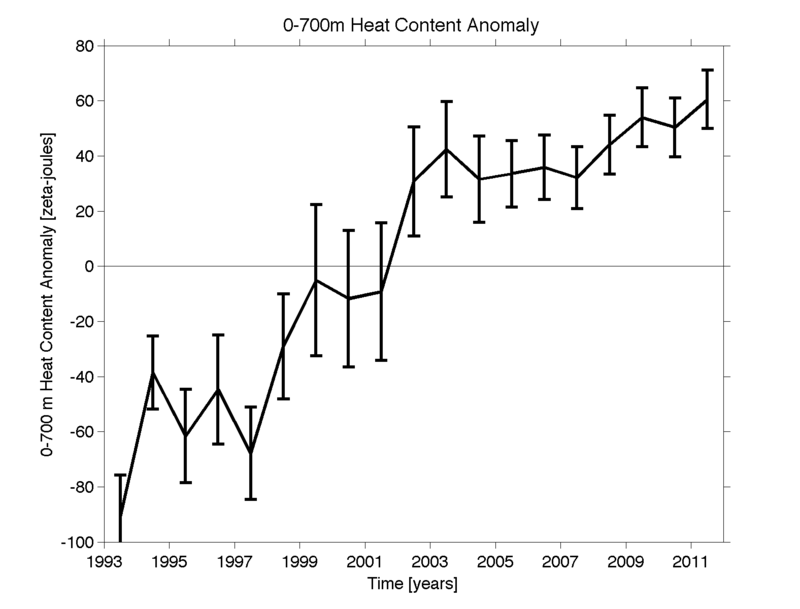 (2012), World ocean heat content and thermosteric sea level change (0-2000), 1955-2010, Geophys. Res. Lett.,doi:10.1029/2012GL051106. McNider, R.T., G.J. Steeneveld, B. Holtslag, R. Pielke Sr, S. Mackaro, A. Pour Biazar, J.T. Walters, U.S. Nair, and J.R. Christy, 2012: Response and sensitivity of the nocturnal boundary layer over land to added longwave radiative forcing. J. Geophys. Res., doi:10.1029/2012JD017578. iv) The human addition to CO2 into the atmosphere is a first-order climate forcing. It is the largest annual-global averaged positive human radiative forcing. IPCC: Climate change 2007: the physical science basis. Contribution of Working Group I to the Fourth Assessment Report of the Intergovernmental Panel on Climate Change (IPCC). 2007.
v) However, global warming is not equivalent to climate change. Significant, societally important climate change, due to both natural- and human- climate forcings, could occur even without global warming or cooling. “Global Warming” is an increase in the global annual average heat content measured in Joules. “Climate Change” is any multi-decadal or longer alteration in one or more physical, chemical and/or biological components of the climate system. Natural causes of climate variations and changes are important. In addition, the human influences are significant and involve a diverse range of first-order climate forcings, including, but not limited to, the human input of carbon dioxide (CO2). Most, if not all, of these human influences on regional and global climate will continue to be of concern during the coming decades. In addition to greenhouse gas emissions, these other first-order human climate forcings that are important to understanding the future behavior of Earth’s climate are spatially heterogeneous and include the effect of aerosols on clouds and associated precipitation, the influence of aerosol deposition (e.g., black carbon (soot), and reactive nitrogen), and the role of changes in land use/land cover. Among their effects is their role in altering atmospheric and ocean circulation features away from what they would be in the natural climate system. As with CO2, the lengths of time that they affect the climate are estimated to be on multidecadal time scales and longer. “Inadvertent Weather Modification” An Information Statement of the American Meteorological Society (Adopted by the AMS Council on 2 November 2010). Pielke Sr., R.A., A. Pitman, D. Niyogi, R. Mahmood, C. McAlpine, F. Hossain, K. Goldewijk, U. Nair, R. Betts, S. Fall, M. Reichstein, P. Kabat, and N. de Noblet-Ducoudré, 2011: Land use/land cover changes and limate: Modeling analysis and observational evidence. WIREs Clim Change 2011, 2:828.850. doi: 10.1002/wcc.144. McAlpine, C.A., W.F. Laurance, J.G. Ryan, L. Seabrook, J.I. Syktus, A.E. Etter, P.M. Fearnside, P. Dargusch, and R.A. Pielke Sr. 2010: More than CO2: A broader picture for managing climate change and variability to avoid ecosystem collapse. Current Opinion in Environmental Sustainability, 2:334-336, DOI10.1016/j.cosust.2010.10.001. vii) Natural variations and longer term change have been significantly underestimated. Also, climate prediction is an initial-value problem. Pielke, R.A., 1998: Climate prediction as an initial value problem. Bull. Amer. Meteor. Soc., 79, 2743-2746. Rial, J., R.A. Pielke Sr., M. Beniston, M. Claussen, J. Canadell, P. Cox, H. Held, N. de Noblet-Ducoudre, R. Prinn, J. Reynolds, and J.D. Salas, 2004: Nonlinearities, feedbacks and critical thresholds within the Earth’s climate system. 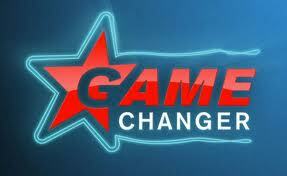 Climatic Change, 65, 11-38.
vii) Policymakers should look for win-win policies in order to improve the environment. The costs and benefits of the regulation of the emissions of CO2 into the atmosphere need to be evaluated together with all other possible environmental regulations. The goal should be to seek politically and technologically practical ways to reduce the vulnerability of the environment and society to the entire spectrum of human-caused and natural risks including those from climate. “We discuss the adoption of a bottom-up, resource-based vulnerability approach in evaluating the effect of climate and other environmental and societal threats to societally critical resources. This vulnerability concept requires the determination of the major threats to local and regional water, food, energy, human health, and ecosystem function resources from extreme events including climate, but also from other social and environmental issues. After these threats are identified for each resource, then the relative risks can be compared with other risks in order to adopt optimal preferred mitigation/adaptation strategies. When I return, I look forward to assessing further the above issues, and also invite readers on my weblog to submit guest posts to appear after I am back, which refute any of the above conclusions. The bottom line conclusion by Danny in his last e-mail fits with my view of this subject. I would, based on their new Statement, be interested in addressing this issue in a revised Statement on Inadvertant Weather Modification. . It seems to me that the new AMS statement on climate change does recognize the roles of aerosols, land use changes and other factors apart from CO2. See the quote below. “Human activity also affects climate through changes in the number and physical properties of tiny solid particles and liquid droplets in the atmosphere, known collectively as atmospheric aerosols. Examples of aerosols include dust, sea salt, and sulfates from air pollution. Aerosols have a variety of climate effects. They absorb and redirect solar energy from the sun and thermal energy emitted by Earth, emit energy themselves, and modify the ability of clouds to reflect sunlight and to produce precipitation. Aerosols can both strengthen and weaken greenhouse warming, depending on their characteristics. Most aerosols originating from human activity act to cool the planet and so partly counteract greenhouse gas warming effects. Aerosols lofted into the stratosphere [between about 13 km (8 miles) and 50 km (30 miles) altitude above the surface] by occasional large sulfur-rich volcanic eruptions can reduce global surface temperature for several years. By contrast, carbon soot from incomplete combustion of fossil fuels warms the planet, so that decreases in soot would reduce warming. Aerosols have lifetimes in the troposphere [at altitudes up to approximately 13 km (8 miles) from the surface in the middle latitudes] on the order of one week, much shorter than that of most greenhouse gases, and their prevalence and properties can vary widely by region. Changes in aerosols and land use are major components in the anthropogenic-forced changes of Earth energy budget, and we cant get both weather and climate right without quantifying their effects, and much less the climate change. But I would defend the emphasis on the greenhouse gases as being pointed out in the new statement as the dominant cause for warming trend in the last half century. While aerosols have not risen systematically during that period (re global deeming and brightening), CO2 and other GHGs did. conflicts with our Statement and a wide range of other findings reported in the literature. Their statement of hindcast model quality of climate change can easily be shown to be false. trivialize, as I read the Statement, their role in climate change. I agree with Danny that aerosols are acknowledged as a source of change, but we could further discuss a possible revised statement (if the AMS is willing to accept one from us at this time) at our Jan committee meeting. Hi Bob. Acknowledging aerosols as a source of change is not the issue. It is their identification of CO2 and a few other greenhouse gases as the dominant climate forcing. It is just one of a suite of first order human climate forcings, in my view. If we share that view, then the AMS Statement is not accurate. I see no conflict between the two AMS statements. The new one addresses global climate, and recognizes regional impacts of aerosols and land surface changes, which is what the older statement says. What is the problem? Blog posts and submitted papers are not sufficient evidence to do anything. I don’t understand what changes would be made in the Statement on Inadvertant Weather Modification. Anyway, it addresses weather and not climate. I list peer reviewed papers that conflict with the AMS Statement. These are not submitted papers. The blog posts are just used to communicate these papers and the NRC assessment to others. Also we discuss climate in our Inadvertent Weather Modification Statement. Clearly regional climate change is affected by land use and aerosols. But for the global average climate, the dominant forcing is the increase of anthropogenic greenhouse gases. Global warming is reduced by the net effect of tropospheric aerosols, but it continues because the greenhouse gas emissions and current concentrations still produce a net positive radiative forcing. Your claims seem to imply that greenhouse gas emissions are not a serious environmental hazard. Don’t you think that global warming is dangerous and that continued greenhouse gas emissions, particularly carbon dioxide, should be reduced as soon as we can? Or are you against mitigation? Thank you for your permission. I will certainly include what you wrote. In terms of your question, I agree with you that the continued elevation of atmospheric concentrations of CO2 is a major concern. We are entering uncharted territory, and the less regrets approach must be to seek effective ways to limit this increase in CO2. My even greater concern, however, with respect to CO2 is in its biogeochemical effect (to the biosphere). Even if there were only a relatively small contribution to global warming from CO2, the effect on plant diversity (e.g. genetic response), plant function, etc could be very significant, and we do not understand the risks that society and the environment face from this biogeochemical effect. to build consensus has to how to move forward [I subscribe to the approach my son advocates in his book “the Climate Fix” with respect to how to deal with the CO2 part of climate]. I hope this clarifies my perspective. In terms of the new AMS Statement on Climate Change, they fail, in my view, to accurately present the issue of climate. I don’t really see the problem with the AMS statement on climate change. It does not undervalue the role of aerosols and land use in altering the climate. It merely states that the trend in the anthropogenic climate forcing was dominated by increasing GHG (while other components of the forcing had not such a clear rising trend during the last 50 years). Then it makes the connection between the trends in rising GHG and global temperatures. Otherwise, your reservations might come across as if you dispute the notion that increasing GHG is causing increasing global temperatures. Did you really mean that? “the anthropogenic climate forcing was dominated by increasing GHG”. This claim is clearly inaccurate. I am surprised that you accept this as your work shows that aerosols from human activities have altered CCN concentrations globally. Flood or Drought: How Do Aerosols Affect Precipitation? by Daniel Rosenfeld, Ulrike Lohmann, Graciela B. Raga, Colin D. O’Dowd, Markku Kulmala, Sandro Fuzzi, Anni Reissell, Meinrat O. Andreae, Science 5 September 2008: Vol. 321. no. 5894, pp. 1309 – 1313 DOI: 10.1126/science.1160606. Andreae and Rosenfeld, 2008: Aerosol–cloud–precipitation interactions. Part 1. The nature and sources of cloud-active aerosols. Earth System Reviews. I could list similar findings with respect to LULCC. The increasing GHG did not dominate anthropogenic climate forcing over the last decades. Unfortunately, the human effects are more serious than that. With respect to your question as to whether I dispute the notion that increasing GHGs is causing increasing global temperatures, clearly added CO2 and other greenhouse gases is a first-order positive radiative forcing. Clearly, I agree that increasing GHGs are contributing to an increase. Geophys. Res. Lett., doi:10.1029/2009GL038932, in press. (accepted 9 July 2009). iv) land use/land cover effects – which in a global average change in heat content seem to average out, but have large regional effects on climate and the resultant effect on cloud cover is not known; e.g. Finally, it seems that we have a disagreement as to what is meant by anthropogenic climate forcing. In my view, it is much more than a change in the global average temperature (or global average TOA radiative imbalance). reinforces the need for this broader view. In terms of seeking to mitigate and adapt to the effect of humans on the climate system, I have concluded that the focus on CO2 and a few other greenhouse gases as the dominate concern is not only inaccurate, but will lead to poor policy decisions. Finally, do I have your permission (and Alan yours too) to post our e-mail exchanges on my weblog? should be qualified to the climate scale. Here we need indeed to separate the effects on regional and weather scales from the global and climate scales, as Lovejoy has now so nicely defined. The amounts of anthropogenic aerosols on a global scale probably have already peaked. 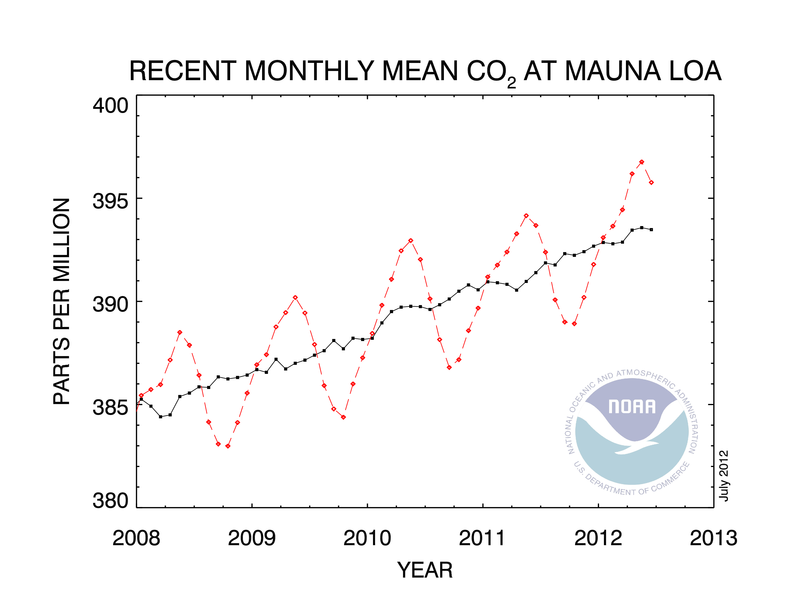 But the GHG concentrations keep accelerating. This means that the GHG dominate the trend of the globally averaged long term trend of the temperature, but at the regional scale other effects may dominate the trends of temperature and other parameters. 1. On a regional scale, the aerosols can be the dominant anthropogenic climate forcing. 2. On a global scale, the aerosols might be in par with the GHG. We just don’t know. The inability to quantify the possibly large radiative forcing prevents us from quantifying adequately the climate sensitivity and hence from predicting the expected global warming due to a given added GHG-induced radiative forcing. This does not contradict the AMS statement that “the dominant cause of the rapid change in climate of the past half century is human-induced increases in the amount of atmospheric greenhouse gases”. This is in fact a discussion on the boundary between weather modification and climate change. The impacts on the ecosystems certainly happen at the regional scales. So where do we put the distinction between weather modification and climate change? Roger, Your discussion has been very helpful to recognize this as a major question and the confusion that it incurs, which we as a committee need to address, and perhaps negotiate with the AMS committee on climate variability and change. What is the distinction between weather modification and climate change? It seems to me that weather is necessarily a component of the climate system. One can separate by averaging time (i.e. long term statistics), but this is clearly quite arbitrary. We often, for example,talk about the “microclimate” of a location and use this information to explain variations in local weather observations. Many use “seasonal climate predictions” when what they really mean are “season averaged weather statistics”. Excellent New Paper “The Climate Is Not What You Expect” By Lovejoy and Schertzer 2012. There does need to be a clearer (overdue in my view) definition of terminology and the AMS committees provide one effective set of venues to do this. Fragkias, F. and K.C. Seto, 2012: The rise and rise of urban expansion Urban land area has expanded globally during the past few decades – a trend that looks set to continue in the foreseeable future. IGBP Newsletter, 78. March 2012. Can I post our e-mail exchanges? Alan (and Bob) have okayed his. Yes, you can post our email exchange. UPDATE #2: To make sure everyone clearly recognizes my involvement with both papers, I provided Anthony suggested text and references for his article [I am not a co-author of the Watts et al paper], and am a co-author on the McNider et al paper. The time of observation biases clearly are a problem in using raw data from the US Cooperative stations. Six stations used in this study have had documented changes in times of observation. Some stations, like Holly, have had numerous changes. Some of the largest impacts on monthly and seasonal temperature time series anywhere in the country are found in the Central Great Plains as a result of relatively frequent dramatic interdiurnal temperature changes. Time of observation adjustments are therefore essential prior to comparing long-term trends. We attempted to apply the time of observation adjustments using the paper by Karl et al. (1986). The actual implementation of this procedure is very difficult, so, after several discussions with NCDC personnel familiar with the procedure, we chose instead to use the USHCN database to extract the time of observation adjustments applied by NCDC. We explored the time of observation bias and the impact on our results by taking the USHCN adjusted temperature data for 3 month seasons, and subtracted the seasonal means computed from the station data adjusted for all except time of observation changes in order to determine the magnitude of that adjustment. An example is shown here for Holly, Colorado (Figure 1), which had more changes than any other site used in the study. What you would expect to see is a series of step function changes associated with known dates of time of observation changes. However, what you actually see is a combination of step changes and other variability, the causes of which are not all obvious. It appeared to us that editing procedures and procedures for estimating values for missing months resulted in computed monthly temperatures in the USHCN differing from what a user would compute for that same station from averaging the raw data from the Summary of the Day Cooperative Data Set. This simply points out that when manipulating and attempting to homogenize large data sets, changes can be made in an effort to improve the quality of the data set that may or may not actually accomplish the initial goal. Overall, the impact of applying time of observation adjustment at Holly was to cool the data for the 1926–58 with respect to earlier and later periods. The magnitude of this adjustment of 2 °C is obviously very large, but it is consistent with changing from predominantly late afternoon observation times early in the record to early morning observation times in recent years in the part of the country where time of observation has the greatest effect. Time of observation adjustments were also applied at five other sites. Until this issue is resolved, the Game Changer aspect of the Watts et al 2012 study is tenative. [Anthony reports he is actively working to resolve this issue on hold ]. The best way to address the TOB issue is to use data from sites in the Watts et al data set that have hourly resolution. For those years, when the station is unchanging in location, compute the TOB. The Karl et al (1986) method of TOB adjustment, in my view, needs to be more clearly defined and further examined in order to better address this issue. I understand research is underway to examine the TOB issue in detail, and results will be reported by Anthony when ready. One paper [Watts et al 2012] show that siting quality does matter. A warm bias results in the continental USA when poorly sited locations are used to construct a gridded analysis of land surface temperature anomalies. The other paper [McNider et al 2012] shows that not only does the height at which minimum temperature observations are made matter, but even slight changes in vertical mixing (such as from adding a small shed near the observation site, even in an otherwise pristine location) can increase the measured temperature at the height of the observation. This can occur when there is little or no layer averaged warming. that variations in surface temperature anomalies are random and this can be averaged to create area means that are robust measures of the average surface temperature in that region (and when summed globally, provide an accurate global land average surface temperature anomaly). Randomness, and with assumption of no systematic biases, is shown in the two papers to be incorrect. Lanzante et al 2005: What do observations indicate about the changes of temperatures in the atmosphere and at the surface since the advent of measuring temperatures vertically? “Currently, there are three main groups creating global analyses of surface temperature (see Table 3.1), differing in the choice of available data that are utilized as well as the manner in which these data are synthesized. My Comment: Now there is the addition of Richard Muller’s BEST analysis. My Comment: The “frozen grids” combine data from poor- and well-site locations, and from different heights. A warm bias results. This is a similar type of analysis as used in BEST. The second technique is sub-sampling a spatially complete field, such as model output, only where in situ observations are available. Again the errors are small (e.g., the standard errors are less than 0.06ºC for the observing period 1880 to 1990; Peterson et al., 1998b). My Comment: Again, there is the assumption that no systematic biases exist in the observations. Poorly sited locations are blended with well-sited locations which, based on Watts et al (2012), artificially elevates the sub-sampled trends. The third technique is comparing optimum averaging, which fills in the spatial field using covariance matrices, eigenfunctions or structure functions, with other analyses. Again, very small differences are found (Smith et al., 2005). The fidelity of the surface temperature record is further supported by work such as Peterson et al. (1999) which found that a rural subset of global land stations had almost the same global trend as the full network and Parker (2004) that found no signs of urban warming over the period covered by this report. My Comment: Here is where the assumption that the set of temperature anomalies are random is presented. Watts et al (2012) provide observational evidence, and McNider et al (2012) present theoretical reasons, why this is an incorrect assumption. Since the three chosen data sets utilize many of the same raw observations, there is a degree of interdependence. Nevertheless, there are some differences among them as to which observing sites are utilized. An important advantage of surface data is the fact that at any given time there are thousands of thermometers in use that contribute to a global or other large-scale average. Besides the tendency to cancel random errors, the large number of stations also greatly facilitates temporal homogenization since a given station may have several “near-neighbors” for “buddy-checks.” While there are fundamental differences in the methodology used to create the surface data sets, the differing techniques with the same data produce almost the same results (Vose et al., 2005a). My Comment: There statement that there is “the tendency to cancel random errors” is shown in the Watts et al 2012 and McNider et al 2012 papers to be incorrect. This means their claim that “the large number of stations also greatly facilitates temporal homogenization since a given station may have several “near-neighbors” for “buddy-checks.” is erroneously averaging together sites with a warm bias. I look forward to discussing the conclusions of these two studies in the coming weeks and months. It will take more than a couple of sprays to eradicate one of the worst local droughts. Denver reached 100 degrees five consecutive days in its warmest June ever (records began in 1872). As of last week, 100 percent of Colorado fought a D2 (“severe”) drought as labeled by the U.S. Drought Monitor. Nearly three-quarters of the state reached “extreme,” with a few pockets of “exceptional,” the scale’s most intense rating. Boulder has received 59 percent less precipitation than average since April 1, according to Western Regional Climate Center data. A few pessimistic predictions suggest, due to a general warming trend some project to continue, local ski resorts will watch business recede faster than the U.S. economy amid Wall Street banking strife. Don’t let doomsayers worry you just yet. Portending some long-term trend based on this year’s weather is dangerous. 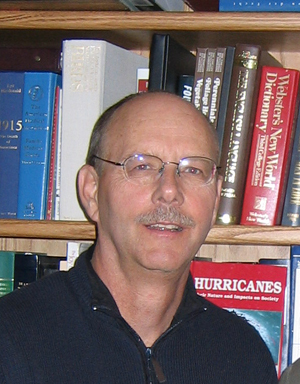 Dr. Roger A. Pielke Sr., one of the most distinguished meteorologists and climate researchers in the state, points to a 2005 study suggesting cyclical oceanic surface temperatures correlate to U.S. drought patterns and have a much greater impact on global climate than previously understood. Since 1995, the North Atlantic (warm) and Pacific (cool) Oceans have combined for a climate proven to produce severe dry weather across much of the Western United States. In July 1934, decades before “global warming” entered the lexicon, more than 80 percent of the United States was in moderate, severe or extreme drought, according to the National Oceanic and Atmospheric Administration. Less than half the country is experiencing some level of drought right now. Large-scale climate projections find it difficult to recognize patterns even in “hindsight” mode, many climatologists believe. In any event, skiers should not fear. 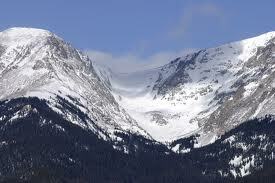 It’s next to impossible to predict Colorado’s climate. “There is no predictive skill on how Colorado’s weather will be in the coming years, despite claims from some to the contrary. Indeed, the climate system is much more complex than you typically hear. Not only is the human influence more complex, but natural climate forcings and feedbacks are incompletely understood,” Pielke Sr. said. This is a refreshing, well written article. Ye, Z., M. Segal, and R.A. Pielke, 1990: A comparative study of daytime thermally induced upslope flow on Mars and Earth. J. Atmos. Sci., 47, 612-628. Rafkin, S.C. Randell, A. Rothchild, T. I. Michaels, and R.A. Pielke, Sr., 2012: Wind-Enhanced Interaction of Radiation and Dust (WEIRD) and the growth and maintenance of local dust storms on Mars.The International Journal of Mars Science and Exploration, submitted. I was also on a JPL review committee that discussed, based on a Mars versions of the models MM5 and RAMS, where the risks were too large for the Martian Rovers – Spirit and Opportunity to land. Currently, I continue to work with Scot Rafkin of Southwest Labs in Boulder Colorado, developer and leader on the Martian (and now also the Titan) versions of the Mars Regional Atmospheric Modeling System (see). Thus, I was disappointed to see NASA’s decision to deemphasize planetary exploration using robotics in order to spend funds on the much more expensive human space program (although some planetary missions are retained; see). With the development of high-capacity and high-performance computing and robotics, the need for human space missions has become much less needed. Indeed, it seems the only reasons are political competition with other countries (e.g. China) and to show that humans can live in space. Most of us are certainly intrigued by human space flight (Star Trek Next Generation is a great motivational reason :-)), but the actual additions to our scientific knowledge, other than the effects on humans of being in space, have been slight. The greatest scientific achievements in space have been on the planetary, asteroid and solar missions, and in the Earth orbiting satellites (both looking at Earth and looking outward at the vast and diverse material that makes up the Universe. 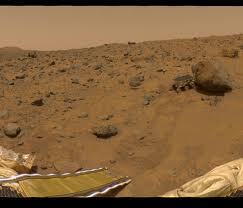 Where now for Mars exploration? It’s the planetary scientists who probably have the glummest faces a day after President Obama announced his 2013 budget request for Nasa. Planetary science loses 20% of its current $1.5bn budget, with Mars exploration taking the single biggest hit, down from $587m this year to $360m next year – a 39% reduction. The chief casualty, as I predicted last week, is the Americans’ joint missions to the Red Planet with Europe in 2016 and 2018.
and ExoMars rover in 2018. Charles Bolden and his new science chief, “Hubble repairman” John Grunsfeld, think they have a workable scenario. They want future efforts at the Red Planet to be a better fit with human spaceflight ambitions. That is, future robotic ventures at Mars must do stuff which feeds into an eventual manned mission that Barack Obama has said should be a goal for the 2030s. Congress should reject this approach and insist on sustaining a robust planetary program even if this reduces the funding, for the time being, for human space travel. When we have the luxury to do a human mission to Mars, those funds can be added back. But if the current reduction in non-human space activities persists, we will have less scientific knowledge in which to base human travel to Mars and elsewhere. I am posting below an e-mail I sent in late June to Jay Fein and Margaret Cavanaugh at the National Science Foundation regarding what I view as fatal problems with impact studies in the coming decades based on multi-decadal global climate predictions. These impact studies are based on an assumed skill at downscaling to regional and local regions where these impacts would occur. “1. As a necessary condition for an accurate prediction, the multi-decadal global climate model simulations must include all first-order climate forcings and feedbacks. However, they do not [see for example: NRC, 2005; Pielke Sr. et al., 2009]. 2. These global multi-decadal predictions are unable to skillfully simulate major atmospheric circulation features such the Pacific Decadal Oscillation [PDO], the North Atlantic Oscillation [NAO], El Niño and La Niña, and the South Asian monsoon [Pielke Sr., 2010; Annamalai et al., 2007]. 3. While dynamic regional downscaling yield higher spatial resolution, the regional climate models are strongly dependent on the lateral boundary conditions and interior nudging by their parent global models [e.g., see Rockel et al., 2008]. Large-scale climate errors in the global models are retained and could even be amplified by the higher spatial resolution regional models. 4. Since as reported, the global multi-decadal climate model predictions cannot accurately predict circulation features such as the PDO, NAO, El Niño, and La Niña [Compo et al., 2011] they cannot provide accurate lateral boundary conditions and interior nudging to the regional climate models. 5. The regional models themselves do not have the domain scale (or two-way interaction) to skillfully predict these larger-scale atmospheric features. 6. There is also only one-way interaction between regional and global models which is not physically consistent. If the regional model significantly alters the atmospheric and/or ocean circulations, there is no way for this information to alter the larger-scale circulation features which are being fed into the regional model through the lateral boundary conditions and nudging. 7. When higher spatial analyses of land use and other forcings are considered in the regional domain, the errors and uncertainty from the larger model still persists thus rendering the added complexity and details ineffective [Ray et al. 2010; Mishra et al. 2010]. 8. The lateral boundary conditions for input to regional downscaling require regional-scale information from a global forecast model. However the global model does not have this regional-scale information due to its limited spatial resolution. This is, however, a logical paradox since the regional model needs something that can only be acquired by a regional model (or regional observations). Therefore, the acquisition of lateral boundary conditions with the needed spatial resolution becomes logically impossible. Finally, There is sometimes an incorrect assumption that although global climate models cannot predict future climate change as an initial value problem, they can predict future climate statistics as a boundary value problem [Palmer et al., 2008]. With respect to weather patterns, for the downscaling regional (and global) models to add value over and beyond what is available from the historical, recent paleo-record, and worse case sequence of days, however, they must be able to skillfully predict the changes in the regional weather statistics. I plan to post on my request for information from you on my science issues regarding downscaling in order to obtain multi-decadal regional climate impacts. While, as you requested, I will not reproduce your e-mails but I will report that I have contacted you on this. Quite frankly, in my view, this is a waste of large amounts of NSF funding on climate. However, I welcome responses, which I can post, that seek to refute this conclusion in order to facilitate a much overdue debate on these questions. The failure of Jay Fein and Margaret Cavanaugh of the National Science Foundation to even have the courtesy of a reply to the issues I am raising illustrates a failure in accountability of this US federal agency. They hold the authority over funding these multi-decadal climate prediction impact studies without any oversight over the scientific robustness of this methodology. Huge amounts of money are being wasted in this misuse of modeling. The human addition of CO2 into the atmosphere is a first-order climate forcing. We need an effective policy to limit the atmospheric concentration of this gas. However, humans are significantly altering the climate system in a diverse range of ways in addition to CO2. The information that I am presenting will assist in properly placing CO2 policies into the broader context of climate policy. The human influence on climate is significant and involves a diverse range of first-order climate forcings, including, but not limited to the human input of CO2. Thus climate policy that is designed to mitigate the human impact on regional climate by focusing only on the emissions of CO2 is seriously incomplete unless these other first-order human climate forcings are included, or complementary policies for these other human climate forcings are developed. Moreover, it is important to recognize that climate policy and energy policy, while having overlaps, are distinctly different topics with different mitigation and adaptation options. In conclusion, humans are significantly altering the global climate, but in a variety of diverse ways beyond the radiative effect of carbon dioxide. The CCSP assessments have been too conservative in recognizing the importance of these human climate forcings as they alter regional and global climate. These assessments have also not communicated the inability of the models to accurately forecast future regional climate on multi-decadal time scales since these other first-order human climate forcings are excluded. The forecasts, therefore, do not provide skill in quantifying the impact of different mitigation strategies on the actual climate response that would occur as a result of policy intervention with respect to only CO2. Pielke, R.A. Sr., 2005: Public Comment on CCSP Report “Temperature Trends in the Lower Atmosphere: Steps for Understanding and Reconciling Differences“. 88 pp including appendices. E-mail Documentation Of The Successful Attempt By Thomas Karl Director Of the U.S. National Climate Data Center To Suppress Biases and Uncertainties In the Assessment of Surface Temperature Trends. Judy Curry will have an opportunity tomorrow to present her views and I look forward to reading her testimony and those of our other colleagues.